Anonymous Sai Devotee from US says: Om Sairam. This is one of my recent experiences. Baba has blessed me with Udi the universal medicine. I believe truly that Udi is medicine, medicine is Udi. Devotees whatever is your problem have faith and apply Udi you will surely feel that relief. Suddenly two days back I was having stomach ache like upset and it was increasing like anything. I couldn't bear the pain and was really worried. For some time there wouldn't be any pain and suddenly the pain would start and it was more too. I drank hot water with cumin seeds and plain water and all but all in vain. Now I prayed to Baba sincerely to cure my pain and took Udi mixed with water and drank it. After that suddenly pain which was more was not there and there was only little pain at times. I felt more relieved from pain. The magic of Udi the medicine and Baba's blessings cured my pain and problem. Daily I'm praying to Baba and drinking Udi water so that no pain or problem should be there. Thank You so much Baba. One more sudden swelling happened in my lower abdomen suddenly and started to pain. While seeing that I was shocked as when did it happen. There was pain but not much, but was really scared. I thought that it was due to heat. But it didn't subside at all. I knew Baba is there with me. I prayed to Baba, took some Udi, applied in the part and took some Udi mixed with water and drank it. I did for 2 to 3 days believing that Udi was the best medicine. After that when I saw it, there was no swelling at all and no pain in that area. It had reduced a lot and Baba had cured it. Udi had cleared my problems. Thanks Baba for You are always with us to protect us. Have belief in Udi and apply over the affected part, Baba will do the text and cure it completely. Baba, please bless me with a baby soon. Baba, please cure my mom's infection that has occurred and she should be healthy without any problem. Please Baba be with us and cure my mom's problem. I will post it here once the infection is cured by You Baba. Have faith and be patient devotees. Om Sairam. Om Sai Sri Sai Jai Jai Sai. Sai Devotee Harish from US says: Om Sai Ram, My sincere pranams to all people involved in this team publishing all the experience of Sai's children across the globe. May His loving grace be always with you and let Him provide you with all success and happiness. Sai please accept my sincere apologies for publishing this late but nevertheless it is not too late, I hope Baba. I am a simple devotee of Sai basically from India and became attached to Sai in the last year and have seen and have had the fortune of receiving Baba's never ending love and grace in every walk of life. I have surrendered myself to Sai and trying to lead my life as He would wish me to. Coming to my experience, my parents have been looking for my marriage alliances for more than 3 years now and finally during July 2016 a nice proposal came our way with Sai's blessings. Around April/May time frame I started visiting Sai temple on Thursdays and attended dhoop aarti. As is the case with any marriage, there was lot of confusion in fixing the marriage dates between 2 families. Fortunately, the girl also happens to be a huge Sai devotee and I am ever thankful to Sai for that. They were deciding on all kinds of days like Wednesday etc. for the date of marriage in Feb 2017 and I was praying Sai from the bottom of my heart to please intervene and arrange it on Feb 9th 2017 (Thursday). The merciful Fakir, the kind that He is, surprisingly arranged for the girl's family to automatically suggest 9th Feb 2017. It cannot be a coincidence that it is 9th and that too on a Thursday. I had only prayed Baba for the marriage to happen on Thursday. He also arranged it to be on the 9th. Now, I am praying for the marriage ceremony to go well with His blessings and kind grace without any hiccups. I am praying for Sai to come to the marriage in any form He likes and would consider that as a lifetime blessing from my Sai. Please make the world to be free from sufferings and make everyone's faith be at Your feet Appa. Om Sai Ram. Anonymous Sai Devotee from US says: I am from India currently living in the US. Om Sai Ram, Please help me Sai to write this sweet leela of yours. 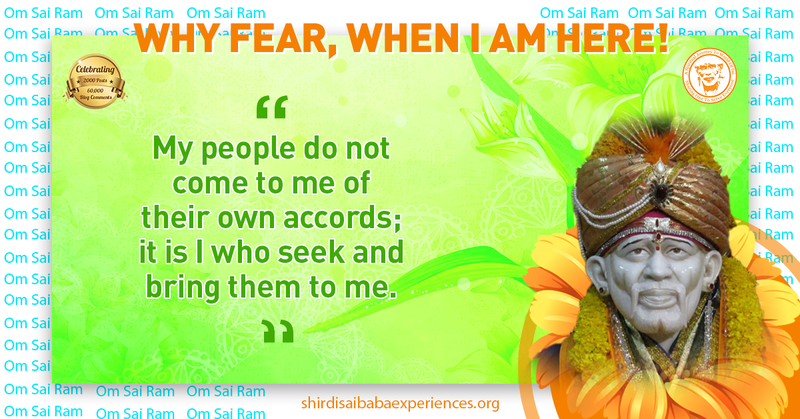 Devotees, with firm faith in our lord Sai, He can make the impossible possible. After all, even inanimate computer PC/web system obeys His commands. Recently, I had to log in to IRCTC website to modify some reservation and I tried 2 times with the same password. Third time, I typed the same password praying lord Sai to help me in this effort. Merciful Sai helped me and the login went through and I was able to complete my work. One thing for sure, anyone and everyone might leave you but if we hold on to the old and holy Padam(feet) of Sai, He will protect us all and take us safely beyond this ocean of mundane existence. Another instance is one time I had to use Q&A website of Sai, I entered my question and got the answer from Him but the wonder is I wasn't even connected to the internet. Om Sairam. I surrender to Your feet Deva. Please protect me always and all beings in this world and the next. I know You are the God of the 3 worlds and Your power is spread just like how every droplet of water is spread across 7 oceans. 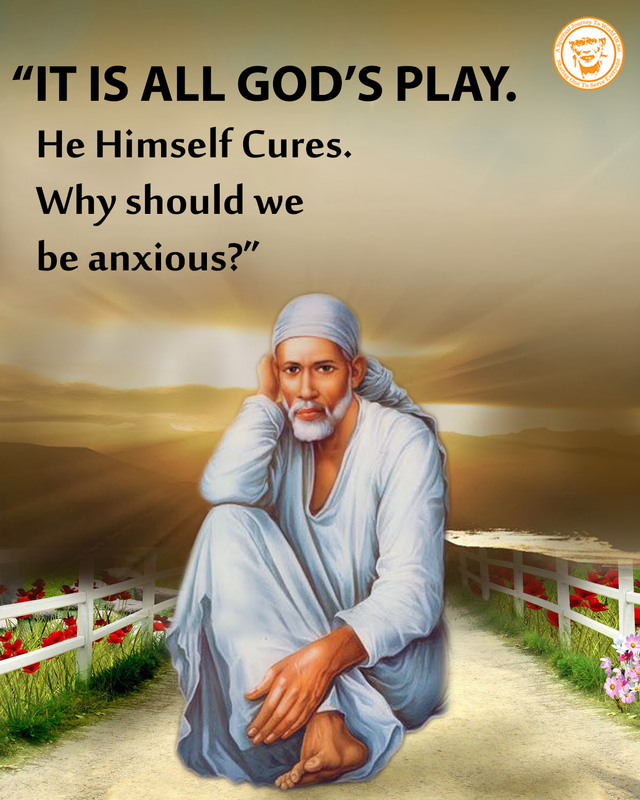 Jai Jai Sai Ram. Om Rajadiraja Yogiraja Parabrahmha Sachidananda Sadguru Sainath Maharaj ki Jai. Om Sai Ram. Anonymous Sai Devotee from India says: Om Sai Ram to all the loving devotees of Baba. Thank you Hetalji for giving us this wonderful platform to share our experiences. May god fulfil all your desires. Coming to my experience this is one of the miracles that I have experienced yesterday. I have moved to US a couple of years back and am working now. Yesterday I had to get my license test done. It was a written exam. Though not tough, O but I was a bit nervous to give it. And yesterday I had to give it. As usual I was tensed. I had practiced some sample questions too. By the time I took the question paper, my mind was totally blank. I just couldn’t recollect anything even most of the questions were from the sample papers that I had done already. But I was not sure of any answer. Just gave random answers and went to the officer to get it corrected. I didn’t have any other option except Baba. As soon as I handed the paper to officer I started chanting Baba’s name in my mind and the miracle had happened as it was obvious. I cleared the test and that too with very minimal mistakes. Thank You very much Sai Baba. I am grateful to You. Kindly be with Your children always. Samartha Sri Satchidhaanandha Sadhguru Sainath Maharaj Ki Jai. Sai Devotee Harish from US says: I am a single male from India presently in the US. Om Sai Ram My humble pranams to Hetalji and her entire team. May Baba bless you all. Oh Deva! Please be with me while I write this sweet leela of Yours. Yesterday, I felt little bit feverish and was praying to Sai for me to not get fever. I drank hot water mixed with Baba's Udi. I requested Him to stop this as I had to go to India for my marriage in 2 days and was praying Him that everything goes well. My merciful Sai prevented the fever from happening and today morning I woke up hale and healthy. Oh Sainath. I surrender to Your holy feet. Please protect all beings and inanimate things in this world with Your loving grace and be with them. Help them and free them from their sufferings. May everyone always chant Your sweet name and remember Your hold feet always. Om Sai Ram. Sai Devotee Sai from India says: Hi I am a Sai devotee. Due to my health issues I didn't have child for 5 years. I was very much disappointed and I prayed to everyone, visited hospitals and then I conceived but faced abortion two times. I went into depression and was crying all the time by remembering the abortions. By seeing me, one of my friends told about Divya Pooja and told me to do that by having faith. Immediately I started the Pooja and within 4 weeks positive result came and I became pregnant. Scanning was fine and from that day onwards Baba is with me all the time. I could see Him at the time of operation also. Baba idol came to me accidentally and I was blessed with a baby girl. This is how Baba blessed me. Have faith in Baba He will see us. 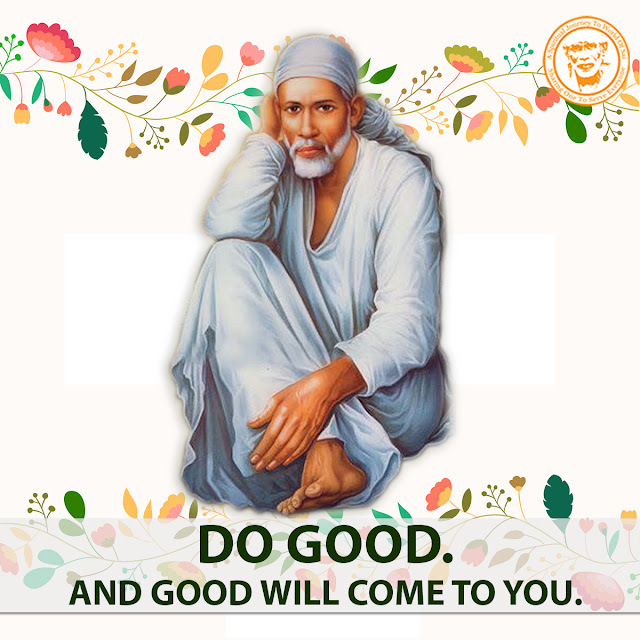 please baba be with me..make me strong..give happy and peaceful life...please make my dreams come true..now you are the only hope baba...i love you..
Om Sai Ram, Love you baba !